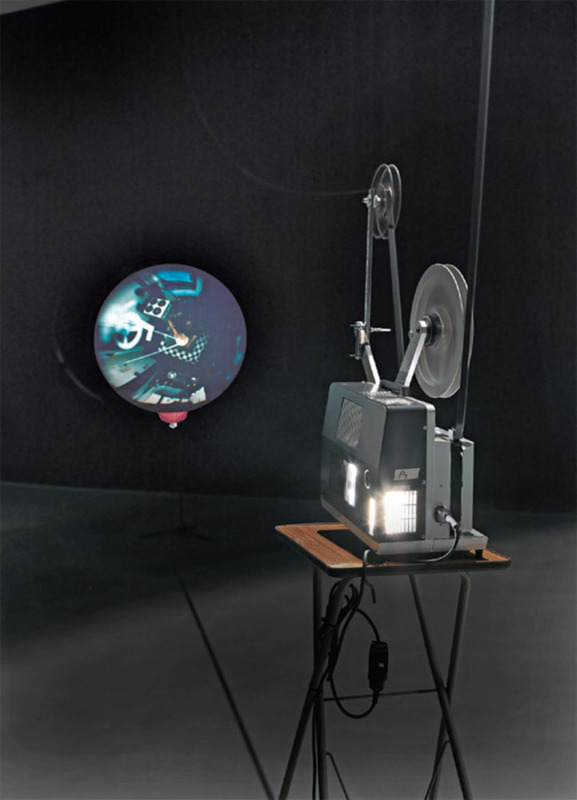 Klaus Lutz, Vulcan, 2004, 16-mm film, projector, balloon, salad strainer, music stand, sound, 2 minutes. Installation view. The Swiss artist and filmmaker Klaus Lutz’s universe was a dense mindscape, full of imaginary creatures and objects, some of them realistically rendered, others more diagrammatic, fantastical, or stylized. The protagonist of his art and films is an individual who confronts the world’s absurdity by being equally absurd but ceaselessly vigilant and disciplined. In Lutz’s last film, Titan, 2009, he is the eccentric little everyman who enjoys undertaking hallucinatory voyages into a surreal outer space while keeping an eye on life on the ground. Played by the artist, this Chaplinesque figure runs, flies, and somersaults in the air over an unnamed metropolis, looking funny and vulnerable.